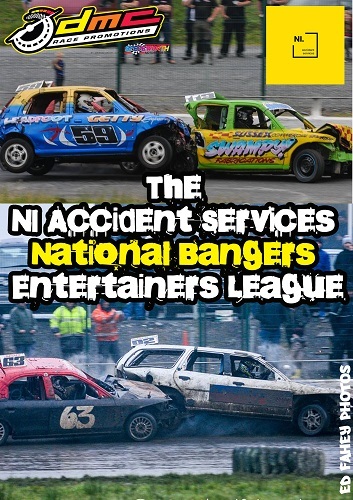 The NI Accident Services DMC Race Promotions National Bangers Entertainers League! Drivers have been asking for quite some time for DMC Race Promotions to bring in a National Bangers Entertainers League, and hopefully it will raise the action levels on track even more! The rules have been devised to suit the local Irish National Bangers scene, with some great feedback received from the drivers. We are very pleased to welcome Lee Johnston of NI Accident Services as sponsor of the Entertainers League. Lee is a keen Banger fan and sometimes racer, and we greatly appreciate his backing of this new venture. NI Accident Services relieve non-fault drivers from the complex claims process & ensure the best for them & their vehicle. One call handles all, covering roadside recovery, like for like replacement vehicle, same day vehicle collection, a range of manufacturer Approved bodyshops and overall a hassle free and cost free service! They can be contacted on 028 3865 2005 or click below to visit their website. 5 points at each meeting for that driver who has taken all the big hits and still came back for more! 1st 25 pts, 2nd 20pts, 3rd 15pts, 4th 10pts, 5th 5pts. An excellent year lies ahead for the National Bangers at DMC Race Promotions, starting with the 2L Irish Teams Championship at Aghadowey Oval on Saturday March 30th. DMC Race Promotions are pleased to announce an exciting new competition for 2019 - the Racewear Design Star Driver of the Month Awards! Each calendar month from April to October, our four man panel of DMC Staff will scour the results of our drivers both at home and away, and nominate five drivers who will then proceed to a poll on the DMC Race Promotions Facebook page. The driver with the most votes will then be crowned the Racewear Design DMC Star Driver of the Month, and will receive a £50 Racewear Design voucher, a trophy and stickers to display on their car. At the end of the season the seven monthly winners will then go into a poll to find the Racewear Design DMC Star Driver of the Year, with the winner receiving a brand new Racewear Design racesuit and the Driver of the Year trophy! All formulas will compete on an even level in this competition, where championship winners could be up against an impressive novice, or a driver who has hit form and recorded victories during that month. The fans will have the final say though, voting for the driver who they believe deserves the accolade each month. Many thanks to Shane Murray and Gavin Pike of Racewear Design for supporting this exciting new initiative, brought to you by DMC Race Promotions, the Ultimate in Ulster Oval Racing! Following the sudden closure of Ballymena Raceway, we have had to make a number of changes to the DMC Race Promotions 2019 Fixture List in order to incorporate the balance of the Simpson Race Exhausts National Hot Rods World Series NI rounds. This has resulted in changes to a number of fixtures for all formulas. 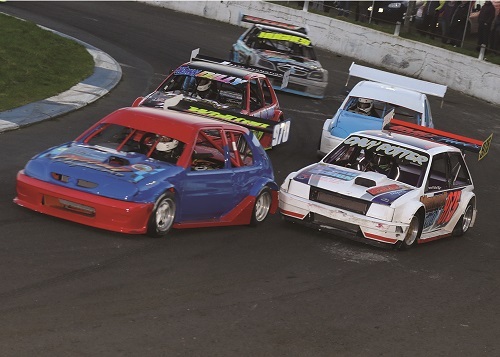 All drivers should check the full revised fixtures for their formula as accommodating the extra National Hot Rods rounds has led to further changes elsewhere. Whilst this is not an ideal scenario, we have endeavoured to fit the extra racing in as best we can. Drivers in all formulas should carefully study the new fixture list. There have also been some start time alterations, most notably on the Easter weekend which will see two very busy meetings. 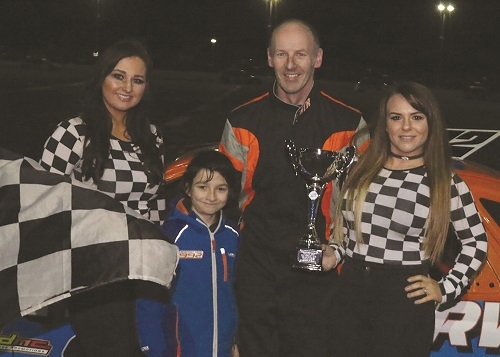 Everyone at DMC Race Promotions were saddened to learn of the closing of Ballymena Raceway, and we would like to take this opportunity to pass on our best wishes for the future to promoter Aubrey Arbuthnot, his family and staff. A mild February evening saw the local oval racers get their first taste of 2019 action, and they served up some excellent racing throughout the meeting. 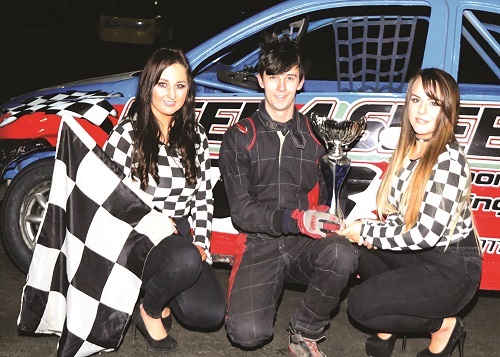 There were heat and final double successes for Portadown duo Scott Cochrane and Vince Litter in the 2.0 Hot Rods and Lightning Rods respectively, whilst Londonderry teenager David Gurney was also at the double with similar successes in the Thunder Rods. 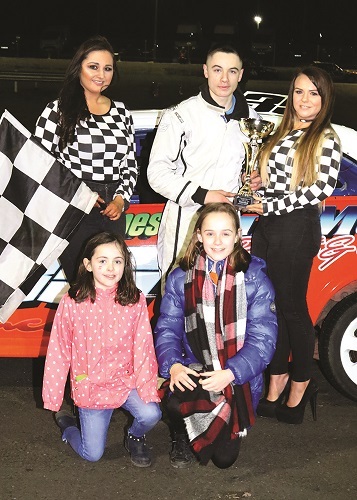 Young Larne ace Samuel Wilson celebrated his first ever feature race win in the well subscribed Stock Rods division, whilst the other feature race at the Hoggs Bar, Loughgall sponsored event fell to Nutts Corner’s Josh McKinstry in the Back To Basics Bangers. An excellent field of 2.0 Hot Rods came under starters orders for their opening heat, which saw local driver Thomas Morrison set the early pace. Former Lightning Rods World Champ Scott Cochrane has caught the eye since his graduation to the 2 Litres, and he swooped past with 5 laps to go to grab the win over Stephen Emerson and Thomas Dilly. Heat two saw some tremendous battling in the pack, as the star drivers struggled to find a way past the stubborn resistance of Colin McFarland. 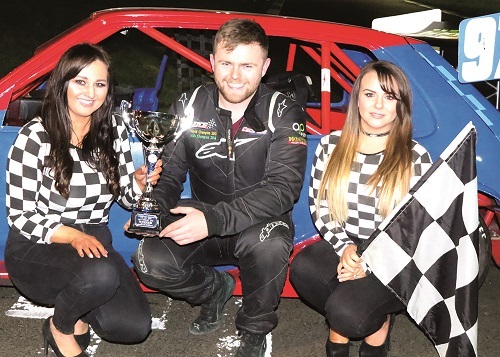 Out front though a four way scrap for the lead between Michael Woods, Brian Cherry, Morrison and Davy Potter was settled right at the death, as Dungannon veteran Potter recorded a popular win over Wood and Morrison. Woods set off at great pace in the final, challenged for the lead initially by Cherry before Dilly tried his luck too. None of them could unseat the impressive Woods from the top spot, until Cochrane arrived on the scene in the closing stages with a posse of star names in tow. Despite the best efforts of Woods, Cochrane found a way past to claim his second win of the night over Adam Best and Woods. The local Stock Rods really are on the crest of a wave at present, with yet another fantastic entry on track. The crowded raceway produced some fantastic racing, with Cullybackey’s Rick Purdy leading the opening heat away. He held sway out front despite some heavy pressure from William Taggart, with the rest closing fast as the laps dwindled down. Former National Champion Micky McFall was the big threat over the final laps, but Purdy held on for a polished win ahead of McFall and Taggart. Purdy then went on to repeat the feat in the second heat, slipping past long time pacesetter Johnny McCloy in the closing stages for his second win of the evening, ahead of Samuel Wilson and McCloy. From such a big field the star men were struggling to make an impact, with McCloy again running out front in the early stages of the final. Wilson had looked mightily impressive all evening, and he slipped past on lap nine to take up the running. A couple of caution periods brought the pack onto Wilson’s bumper to test his resolve, but he calmly remained out front before McFall mounted a stern challenge over the final laps. Teenager Wilson proved equal to the threat though, taking a fantastic final win to mark himself down as one to watch in 2019. McFall and Robert McIlroy completed the podium ahead of McCloy and Stuart Agnew. The Lightning Rods were competing in their first meeting since some major rule changes in the formula, and it was Vince Litter who took the opening heat win after breaking free from Thomas McCrory. Irish Champion Nigel Jackson took second ahead of Richard Stewart. McCrory again led them away in heat two, opening up quite an advantage early on. Litter ran him down in the latter stages but it was to be McCrory’s victory. Litter and Adam McCann filled the top three. McCrory once again led the way in the final, but Litter squeezed past on lap eight to race home to his second victory of the night. That earns him a rise to the star grade for the next meeting, with Ricky Shaw, Tim Hazlett, James McKinney and Stewart the next over the line. Newcomer Daniel Rodgers led the opening laps of the first Thunder Rods heat, being joined in the battle for the lead by Jason Darragh and Jonny Teggart. Teggart found a gap up the inside to take the win over Darragh and Irish Champion Andrew McLean in his new car. Heat two was all about teenage sensation David Gurney as he raced clear to take an emphatic win, and that despite a late caution period which brought the experienced Norman Purdy onto his tail. Behind Purdy, David’s father Davy Gurney Snr took third. David Gurney once again had the bit between his teeth in the Hoggs Bar sponsored final, powering ahead to take a clear victory and earn his second rise in the gradings in as many meetings. Purdy and Teggart took the podium places in this one ahead of Jerome Doherty and Gurney Snr. The Back To Basics Bangers entertained with some great action all evening, with all the drivers really getting stuck in and providing plenty of contact and spins. Dan Shannon took the opening heat ahead of Josh McKinstry and Neil Capper, before Matthew McKinstry came through to land heat two ahead of Josh Goligher and Josh McKinstry. The final was perhaps their race of the night, with all sorts of action on track. Josh McKinstry came through the chaos to take the win over Shannon and Goligher. 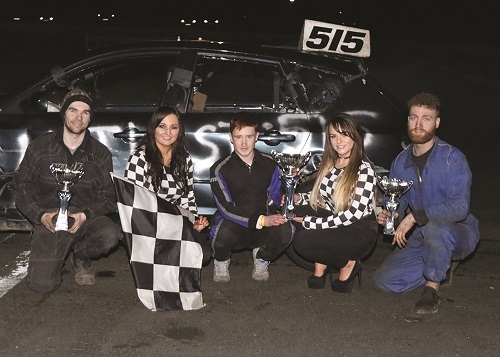 Easter Monday at Aghadowey Oval (April 22nd) will see the richest Stock Rod race meeting ever staged, as the oval racing world gathers to celebrate the memory of the much-missed Ballymoney legend Alan Connolly. The special Alan Connolly Memorial Trophy will see the top drivers in the Stock Rod formula from right across the British Isles travel to race in the former multi-World Champion's honour. Already a fantastic £1800 of extra prize money has been donated by a number of companies including Trevor Hill Race Engines, Murray's of Randalstown, S McAfee & Son, McKinstry Skip Hire, Bell Building, NW Developments, Darrell Hanna Auto Repairs, Cirrus Plastics, DS Autos, Alex Hunter Race Prep and NIOvalTV. As if that wasn't enough, in addition to the above there will also be a number of new parts and vouchers on offer- everything from race tyres to harnesses, shocks to exhausts and everything in between!! These prizes have been kindly donated by LM Paints, Gilmore Engineering, Simpson Race Exhausts, Polleysport, Maxwell Freight Services, Gunner Motorsport, Racemart, DMD Air Art, SP Suspension, Edwards Motorsport, Redline Racing, Racewear Design, Lee Smart Racing, Muppet Motorsport, Chris Hamill Design, JMC Hydrographics and Rick Purdy Race Paint. The aim is to not only enhance the winners prize fund, but also to have multiple grade and spot prizes throughout the afternoon. Former Stock Rods and National Hot Rods World Champion Glenn Bell has already signalled his intention to be on the grid, which should add some extra spice to the occasion. Travel incentives are also available for visiting UK drivers, and ferry deals are available from Holyhead to Dublin for English based racers. 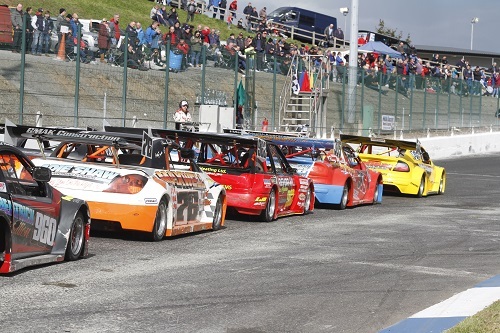 Don't forget the Stock Rods Irish Open Championship takes place at Tullyroan Oval on Easter Saturday evening for those hoping to make a long weekend out of it! It promises to be a festival of Stock Rod racing, a fitting tribute to one of the true gentlemen and legends of our sport. 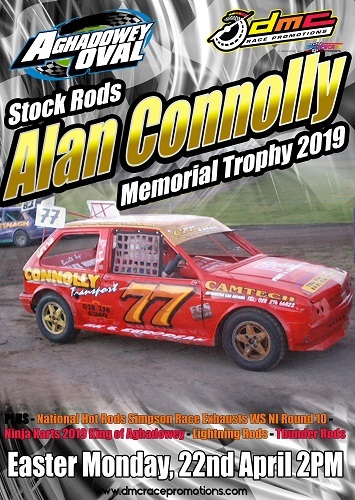 The Stock Rods Alan Connolly Memorial Trophy, Aghadowey Oval, Easter Monday April 22nd 2019.